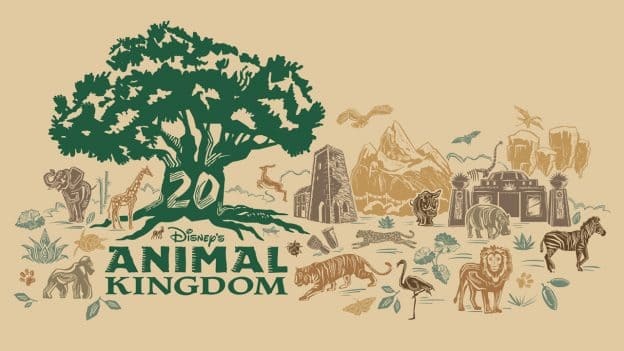 This month, Disney’s Animal Kingdom will mark its 20th anniversary at Walt Disney World Resort. The park, which opened as “a new species of theme park” on April 22, 1998, continues inspiring and educating guests of all ages today through the magic of nature. 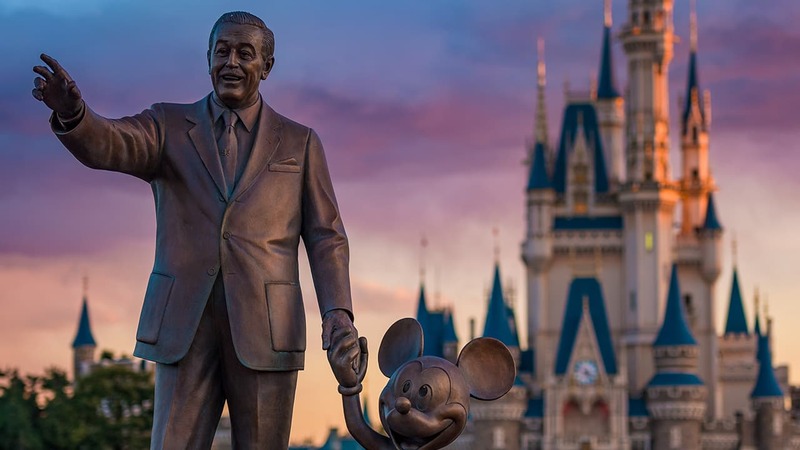 For Disney Parks Merchandise, this milestone occasion was the perfect opportunity for creating an unforgettable collection of merchandise inspired by the theme park’s iconic centerpiece. 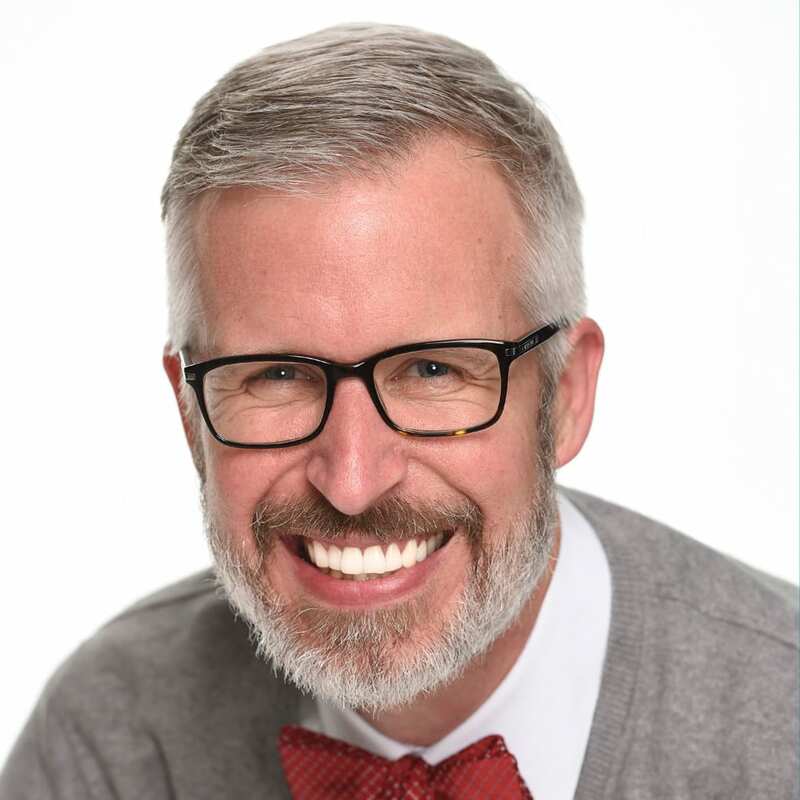 “We mixed earth tone colors with images of animals and icons reminiscent of the beautifully sculpted animal carvings found on the breathtaking Tree of Life,” explained Cody Reynolds, Senior Creative Director with Disney Consumer Products and Interactive Media Creative Group. 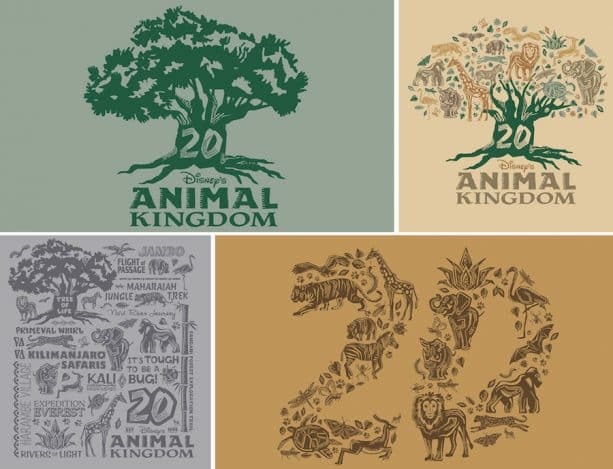 From a banshee at Pandora – The World of Avatar to a Baobab tree from the Kilimanjaro Safaris attractions, artists drew more than 50 stylized animals, icons and graphics for an artwork style guide. Merchandise developers referenced this guide when creating items to ensure the overall assortment had a consistent look. Artwork on a t-shirt and matching water bottle captures the park’s tremendous transformation during the past 20 years, and includes nods to attractions from opening day to the more recent other-worldly additions of Na’vi River Journey and Avatar Flight of Passage. Designed to complement each other, merchandise offered includes a mix of apparel for adults and kids, home décor, accessories and other collectibles such as trading pins or jewelry by ALEX AND ANI. On select products, the merchandise team added hidden surprises in the artwork. A closer examination of drinkware reveals images of tiny ants strategically placed for guests to discover. 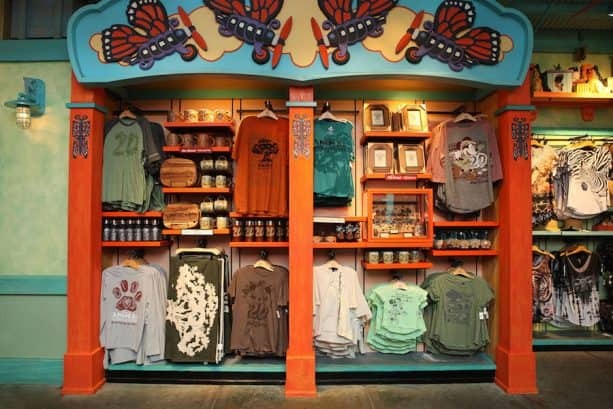 Island Mercantile in Disney’s Animal Kingdom serves as the headquarters for the 20th anniversary assortment. Select products may also be found in shops throughout the park or via Shop Disney Parks. 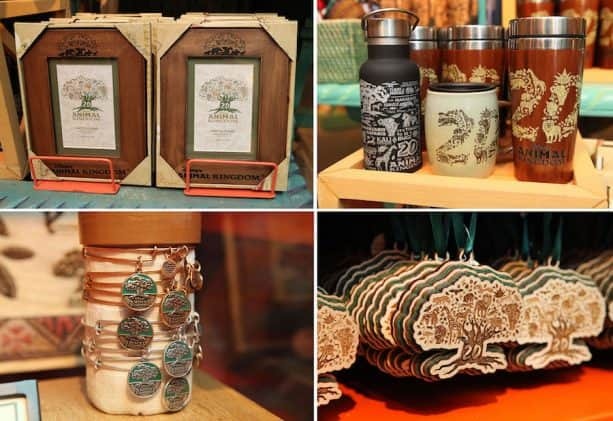 Stay tuned to Disney Parks Blog for details about new limited release items being released at the “Party for the Planet” celebration that kicks off on Earth Day, April 22. Will the new Dooney and Bourke with Animal Print (previewed in the AP Mickey Monitor) release on April 22nd as well? Can you share styles and pricing? @Shanna – Look for another story this week with details about products being released at the “Party for the Planet” celebration that kicks off on Earth Day, April 22. I’d love to know more about that artwork featured in the upper right corner of the last photo. It’s gorgeous! Will it be sold as a print? A blanket? It’s hard to tell from the photo. @Derek – That piece is a wood panel image created by the Arts & Collectibles team. The item is approximately 11″ by 17″ and has a retail of $125. I found it in the display case at Island Mercantile, which you can see in the third image (it’s on the right side of the wall display). The team used elements from the artwork seen in the first image of this article. I agree – it’s beautiful! Am trying to get more info on the AK Dooney. I see it on eBay for $350 right now. How do the secure enough to fill their orders yet annual passholders may not get one? @Kim – You can see images and details about the Dooney & Bourke handbags being released on April 22 in this article link below. 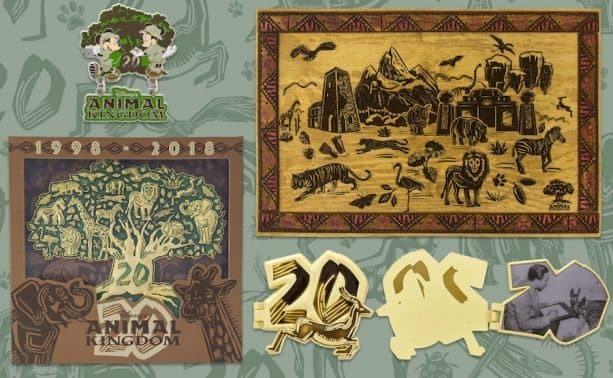 These handbags are not Passholder Exclusive, and will be available to guests on a first come, first serve basis beginning April 22 at Disney’s Animal Kingdom. 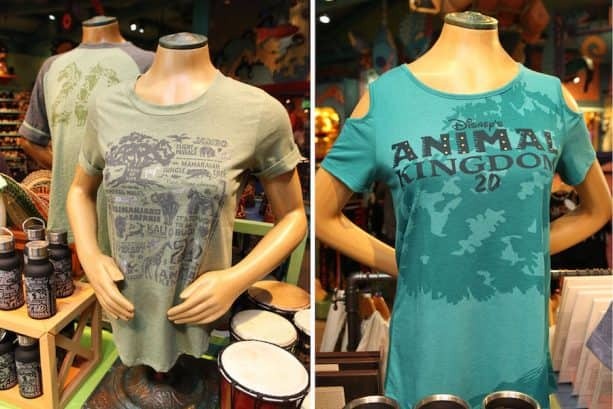 I was at Animal Kingdom on April 5 and looked in every shop including Island Mercantile to find a tree of life with animals t-shirt like the one in the top right corner and couldn’t find anything, there was very little selection so why does it say they’re available at Island Mercantile? @Tina – I’m sorry to hear you weren’t able to locate what you were seeking. I’m unsure which shirt you would like. I found Island Mercantile contained the best assortment of all products created for the 20th Anniversary. Many of these items will be carried throughout the upcoming year. Looking forward to popping over and checking it out after running through DAK early in the morning during the Dark Side Half!